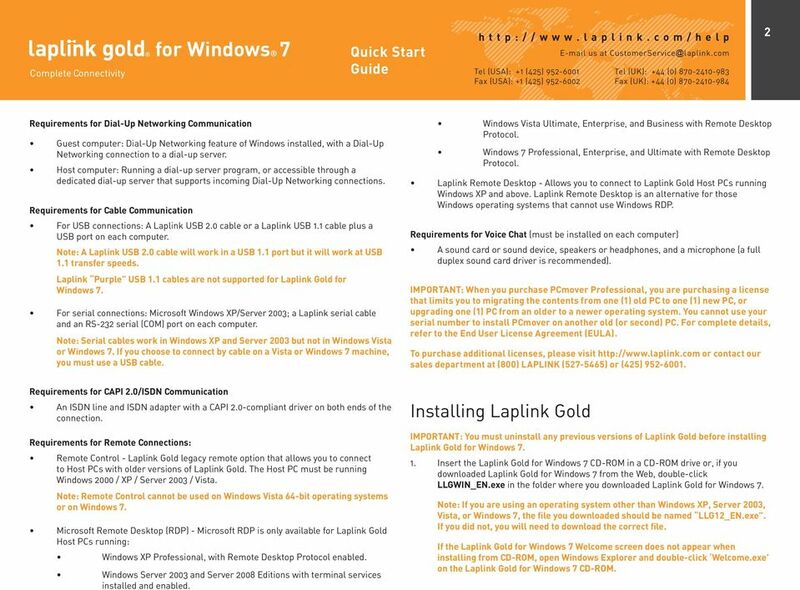 Download "for Windows 7 Laplink Software, Inc. Quick Start Guide h t t p : / / w w w. l a p l i n k. c o m / h e l p MN-LLG-EN-15 (REV." 3 1 With Laplink Gold s award-winning remote control, file transfer, advanced connectivity and synchronization features, you can access , files, and network resources when you re on the road, work with computer users at other locations, schedule file transfers, print documents to a remote printer, and more. 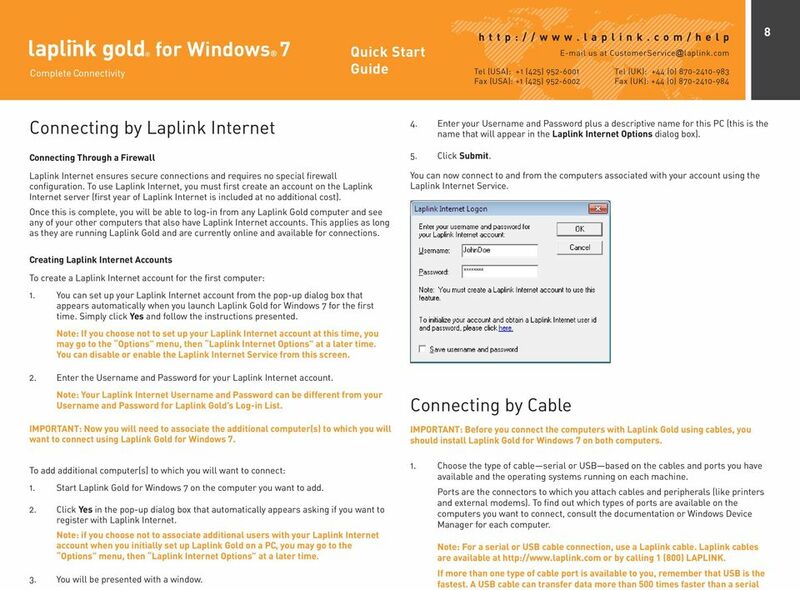 Laplink Gold for Windows 7 offers you a variety of reliable, easy-to-use options for connecting; simply choose the option that is appropriate for the resources available on your computer and the computer you want to connect to. To learn more about Laplink Gold, see the online User and Help. What s New? 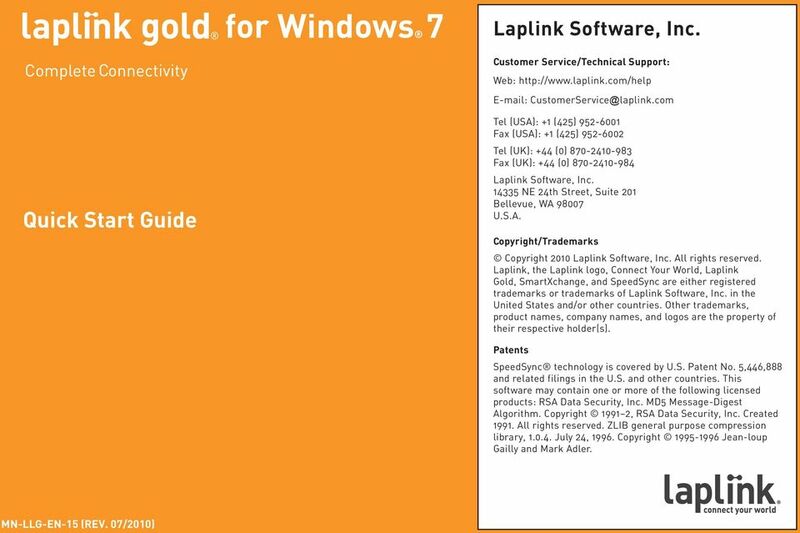 Windows 7 Compatibility Laplink Gold is now Windows 7 compatible! This new version works on Windows XP, Server 2003, Vista, and Windows 7. You can connect to a Laplink computer with an older operating system using Laplink Gold 12 on that system. Glossary Host PC: The Laplink Gold PC to which you connect remotely using Remote Control or Remote Desktop. The Host PC is hosting your connection. Regardless of location, the computer accepting an incoming connection is the Host because it is allowing the Guest to control it. Guest PC: The Laplink Gold PC you use to access the Host PC. Regardless of location, the computer initiating an outgoing connection is the Guest computer. 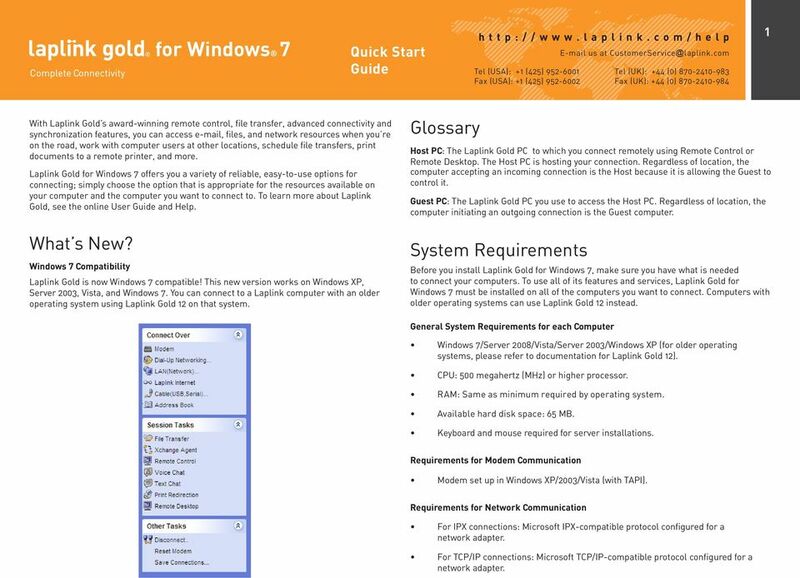 System Requirements Before you install Laplink Gold for Windows 7, make sure you have what is needed to connect your computers. 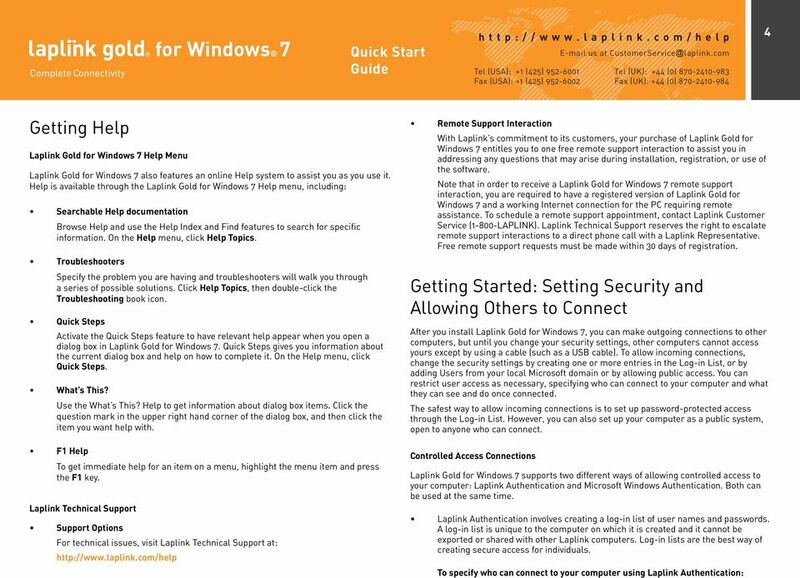 To use all of its features and services, Laplink Gold for Windows 7 must be installed on all of the computers you want to connect. Computers with older operating systems can use Laplink Gold 12 instead. 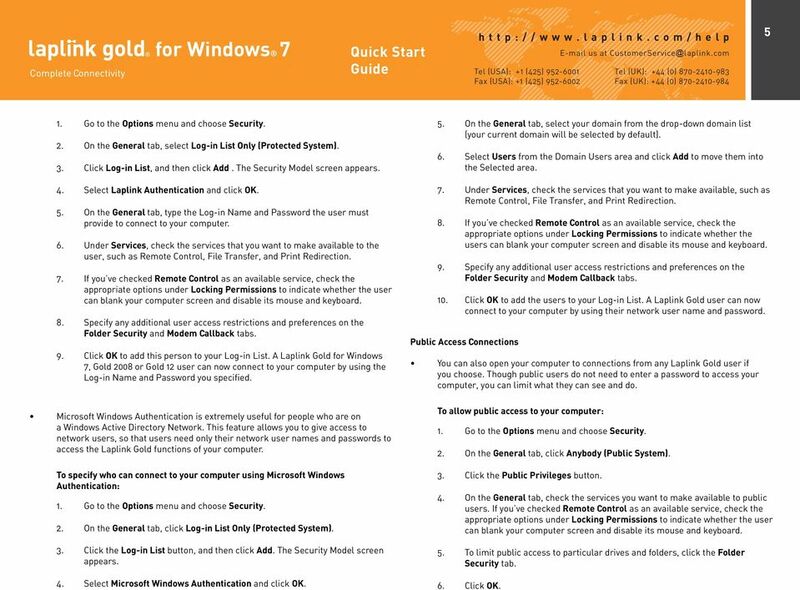 General System Requirements for each Computer Windows 7/Server 2008/Vista/Server 2003/Windows XP (for older operating systems, please refer to documentation for Laplink Gold 12). CPU: 500 megahertz (MHz) or higher processor. RAM: Same as minimum required by operating system. Available hard disk space: 65 MB. Keyboard and mouse required for server installations. Requirements for Modem Communication Modem set up in Windows XP/2003/Vista (with TAPI). Requirements for Network Communication For IPX connections: Microsoft IPX-compatible protocol configured for a network adapter. For TCP/IP connections: Microsoft TCP/IP-compatible protocol configured for a network adapter. 4 2 Requirements for Dial-Up Networking Communication Guest computer: Dial-Up Networking feature of Windows installed, with a Dial-Up Networking connection to a dial-up server. Host computer: Running a dial-up server program, or accessible through a dedicated dial-up server that supports incoming Dial-Up Networking connections. Requirements for Cable Communication For USB connections: A Laplink USB 2.0 cable or a Laplink USB 1.1 cable plus a USB port on each computer. Note: A Laplink USB 2.0 cable will work in a USB 1.1 port but it will work at USB 1.1 transfer speeds. Laplink Purple USB 1.1 cables are not supported for Laplink Gold for Windows 7. For serial connections: Microsoft Windows XP/Server 2003; a Laplink serial cable and an RS-232 serial (COM) port on each computer. Note: Serial cables work in Windows XP and Server 2003 but not in Windows Vista or Windows 7. If you choose to connect by cable on a Vista or Windows 7 machine, you must use a USB cable. Windows Vista Ultimate, Enterprise, and Business with Remote Desktop Protocol. Windows 7 Professional, Enterprise, and Ultimate with Remote Desktop Protocol. Laplink Remote Desktop - Allows you to connect to Laplink Gold Host PCs running Windows XP and above. Laplink Remote Desktop is an alternative for those Windows operating systems that cannot use Windows RDP. Requirements for Voice Chat (must be installed on each computer) A sound card or sound device, speakers or headphones, and a microphone (a full duplex sound card driver is recommended). IMPORTANT: When you purchase PCmover Professional, you are purchasing a license that limits you to migrating the contents from one (1) old PC to one (1) new PC, or upgrading one (1) PC from an older to a newer operating system. You cannot use your serial number to install PCmover on another old (or second) PC. For complete details, refer to the End User License Agreement (EULA). To purchase additional licenses, please visit or contact our sales department at (800) LAPLINK ( ) or (425) Requirements for CAPI 2.0/ISDN Communication An ISDN line and ISDN adapter with a CAPI 2.0-compliant driver on both ends of the connection. Requirements for Remote Connections: Remote Control - Laplink Gold legacy remote option that allows you to connect to Host PCs with older versions of Laplink Gold. The Host PC must be running Windows 2000 / XP / Server 2003 / Vista. Note: Remote Control cannot be used on Windows Vista 64-bit operating systems or on Windows 7. Microsoft Remote Desktop (RDP) - Microsoft RDP is only available for Laplink Gold Host PCs running: Windows XP Professional, with Remote Desktop Protocol enabled. Windows Server 2003 and Server 2008 Editions with terminal services installed and enabled. 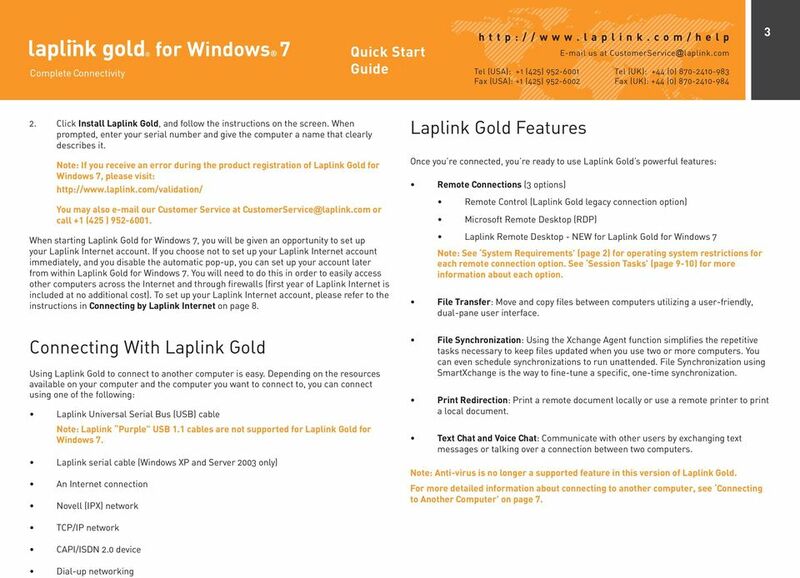 Installing Laplink Gold IMPORTANT: You must uninstall any previous versions of Laplink Gold before installing Laplink Gold for Windows Insert the Laplink Gold for Windows 7 CD-ROM in a CD-ROM drive or, if you downloaded Laplink Gold for Windows 7 from the Web, double-click LLGWIN_EN.exe in the folder where you downloaded Laplink Gold for Windows 7. Note: If you are using an operating system other than Windows XP, Server 2003, Vista, or Windows 7, the file you downloaded should be named LLG12_EN.exe. If you did not, you will need to download the correct file. 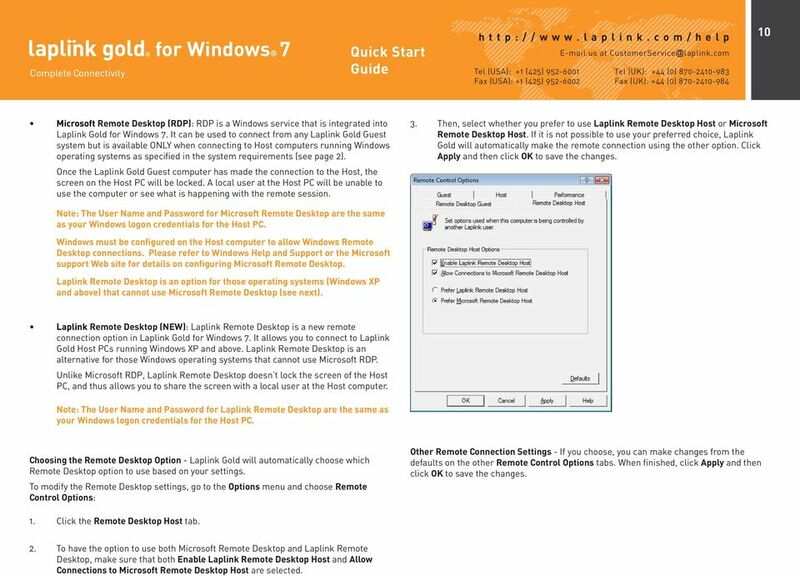 If the Laplink Gold for Windows 7 Welcome screen does not appear when installing from CD-ROM, open Windows Explorer and double-click Welcome.exe on the Laplink Gold for Windows 7 CD-ROM. 7 5 1. Go to the Options menu and choose Security. 2. On the General tab, select Log-in List Only (Protected System). 3. Click Log-in List, and then click Add. The Security Model screen appears. 4. Select Laplink Authentication and click OK. 5. On the General tab, type the Log-in Name and Password the user must provide to connect to your computer. 6. Under Services, check the services that you want to make available to the user, such as Remote Control, File Transfer, and Print Redirection. 7. If you ve checked Remote Control as an available service, check the appropriate options under Locking Permissions to indicate whether the user can blank your computer screen and disable its mouse and keyboard. 8. Specify any additional user access restrictions and preferences on the Folder Security and Modem Callback tabs. 9. Click OK to add this person to your Log-in List. 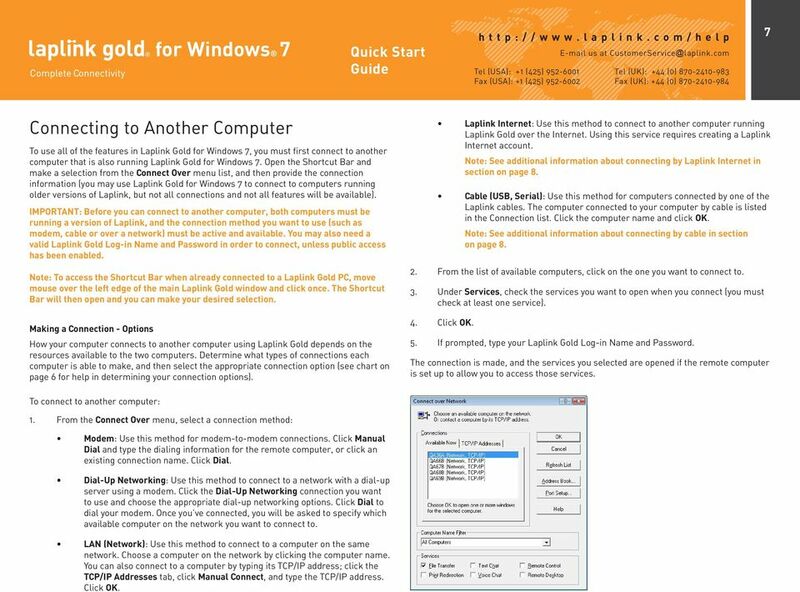 A Laplink Gold for Windows 7, Gold 2008 or Gold 12 user can now connect to your computer by using the Log-in Name and Password you specified. Microsoft Windows Authentication is extremely useful for people who are on a Windows Active Directory Network. This feature allows you to give access to network users, so that users need only their network user names and passwords to access the Laplink Gold functions of your computer. To specify who can connect to your computer using Microsoft Windows Authentication: 1. Go to the Options menu and choose Security. 2. On the General tab, click Log-in List Only (Protected System). 3. Click the Log-in List button, and then click Add. The Security Model screen appears. 4. Select Microsoft Windows Authentication and click OK. 5. On the General tab, select your domain from the drop-down domain list (your current domain will be selected by default). 6. Select Users from the Domain Users area and click Add to move them into the Selected area. 7. Under Services, check the services that you want to make available, such as Remote Control, File Transfer, and Print Redirection. 8. If you ve checked Remote Control as an available service, check the appropriate options under Locking Permissions to indicate whether the users can blank your computer screen and disable its mouse and keyboard. 9. Specify any additional user access restrictions and preferences on the Folder Security and Modem Callback tabs. 10. Click OK to add the users to your Log-in List. A Laplink Gold user can now connect to your computer by using their network user name and password. Public Access Connections You can also open your computer to connections from any Laplink Gold user if you choose. Though public users do not need to enter a password to access your computer, you can limit what they can see and do. To allow public access to your computer: 1. Go to the Options menu and choose Security. 2. On the General tab, click Anybody (Public System). 3. Click the Public Privileges button. 4. On the General tab, check the services you want to make available to public users. If you ve checked Remote Control as an available service, check the appropriate options under Locking Permissions to indicate whether the user can blank your computer screen and disable its mouse and keyboard. 5. To limit public access to particular drives and folders, click the Folder Security tab. 6. Click OK.
8 6 Connecting to Another Computer: Connection Options Laplink Gold for Windows 7 gives you a variety of options for connecting to another computer. To choose the appropriate option, determine what resources are available on the local and remote computers. Connecting from another Laplink Computer over the Internet Can you connect to the Internet on the local computer? Can you connect to the Internet on the remote computer? Then connect to another Laplink computer over the Internet this way: Yes Yes Use Connect over Laplink Internet for simple, secure connections without the hassle of configuring ports or a firewall. No, but I can connect to a network that has an Internet connection. Yes Use Connect over Dial-Up Networking to dial into a network server and connect over the network s Internet connection. Connecting over modems, networks, and cables With this available on the local computer And this available on the remote computer Connect to another Laplink computer this way: modem modem Use Connect over Modem and dial into the modem on the remote computer. modem modem and network Use Connect over Modem to connect directly to the remote computer and access all of the network resources available to that computer. modem network with a dial-up server Use Connect over Dial-Up Networking to dial into the dial-up server and connect to any Laplink computer on the network. network network Use Connect over LAN (Network). serial (only available on Windows XP and Server 2003) or USB port serial (only available on Windows XP and Server 2003) or USB port Note: Laplink s Internet Locator Service (ILS) is no longer an available connection option. Laplink Purple USB 1.1 cables are not supported for Laplink Gold Attach a Laplink serial or Laplink USB cable to each computer. The connection opens automatically. The Belkin USB cable is also a supported USB option. 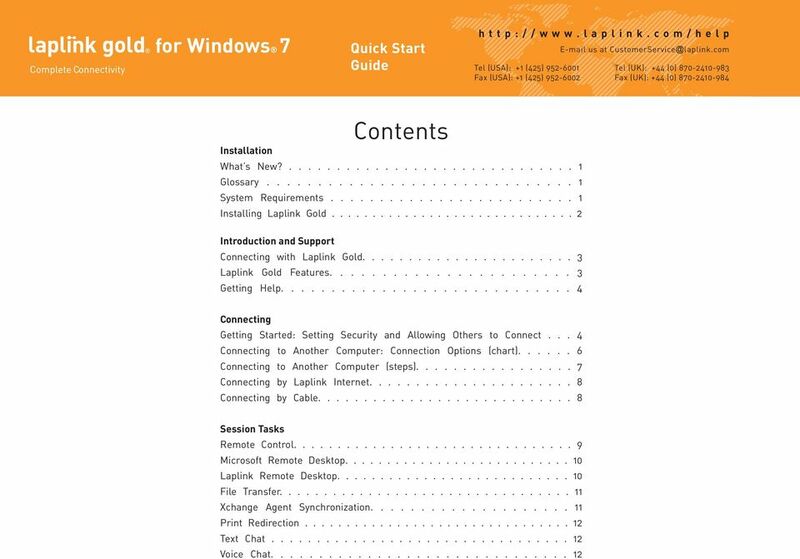 9 7 Connecting to Another Computer To use all of the features in Laplink Gold for Windows 7, you must first connect to another computer that is also running Laplink Gold for Windows 7. Open the Shortcut Bar and make a selection from the Connect Over menu list, and then provide the connection information (you may use Laplink Gold for Windows 7 to connect to computers running older versions of Laplink, but not all connections and not all features will be available). IMPORTANT: Before you can connect to another computer, both computers must be running a version of Laplink, and the connection method you want to use (such as modem, cable or over a network) must be active and available. You may also need a valid Laplink Gold Log-in Name and Password in order to connect, unless public access has been enabled. Note: To access the Shortcut Bar when already connected to a Laplink Gold PC, move mouse over the left edge of the main Laplink Gold window and click once. The Shortcut Bar will then open and you can make your desired selection. Making a Connection - Options How your computer connects to another computer using Laplink Gold depends on the resources available to the two computers. Determine what types of connections each computer is able to make, and then select the appropriate connection option (see chart on page 6 for help in determining your connection options). Laplink Internet: Use this method to connect to another computer running Laplink Gold over the Internet. Using this service requires creating a Laplink Internet account. Note: See additional information about connecting by Laplink Internet in section on page 8. Cable (USB, Serial): Use this method for computers connected by one of the Laplink cables. The computer connected to your computer by cable is listed in the Connection list. Click the computer name and click OK. Note: See additional information about connecting by cable in section on page From the list of available computers, click on the one you want to connect to. 3. Under Services, check the services you want to open when you connect (you must check at least one service). 4. Click OK. 5. If prompted, type your Laplink Gold Log-in Name and Password. The connection is made, and the services you selected are opened if the remote computer is set up to allow you to access those services. To connect to another computer: 1. From the Connect Over menu, select a connection method: Modem: Use this method for modem-to-modem connections. Click Manual Dial and type the dialing information for the remote computer, or click an existing connection name. Click Dial. Dial-Up Networking: Use this method to connect to a network with a dial-up server using a modem. Click the Dial-Up Networking connection you want to use and choose the appropriate dial-up networking options. Click Dial to dial your modem. Once you ve connected, you will be asked to specify which available computer on the network you want to connect to. LAN (Network): Use this method to connect to a computer on the same network. Choose a computer on the network by clicking the computer name. You can also connect to a computer by typing its TCP/IP address; click the TCP/IP Addresses tab, click Manual Connect, and type the TCP/IP address. Click OK.
11 9 cable. While you can attach a USB cable to any USB peripheral that incorporates a hub to which other devices can be connected, we recommend that you plug the USB cable directly into the computer. 2. Once you decide which type of cable connection you will use, attach a Laplink cable to each computer. Attach a Laplink serial cable to a serial port on each computer or a Laplink USB cable to a USB port or USB hub device on each computer. Note: The Belkin USB cable is also a supported USB option, using the included Laplink drivers. Serial cable option is only available on Windows XP and Server Laplink Purple USB 1.1 cables are not supported for Laplink Gold for Windows Start up Laplink Gold for Windows 7. When you launch Laplink Gold on two computers that are connected by a cable, Laplink Gold connects the computers automatically. If necessary, you can also open a cable connection to another computer manually. To manually connect to another computer by cable: a. Go to the Connect Over option on the Shortcut Bar menu. b. Select Connect over... > Cable (USB, serial). c. In the Connection list, select the name of the computer to which you want to connect. d. Under Services, check the services you want to use. e. Click OK. 4. 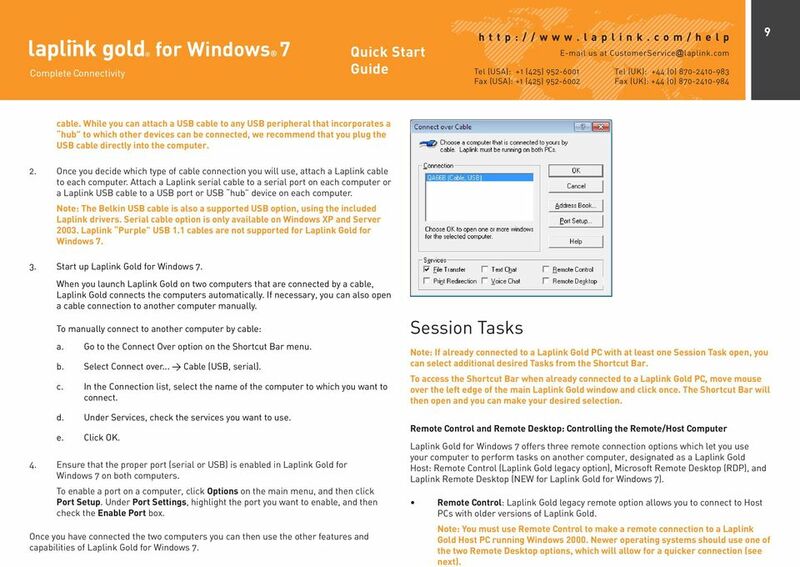 Ensure that the proper port (serial or USB) is enabled in Laplink Gold for Windows 7 on both computers. To enable a port on a computer, click Options on the main menu, and then click Port Setup. Under Port Settings, highlight the port you want to enable, and then check the Enable Port box. Once you have connected the two computers you can then use the other features and capabilities of Laplink Gold for Windows 7. Session Tasks Note: If already connected to a Laplink Gold PC with at least one Session Task open, you can select additional desired Tasks from the Shortcut Bar. To access the Shortcut Bar when already connected to a Laplink Gold PC, move mouse over the left edge of the main Laplink Gold window and click once. The Shortcut Bar will then open and you can make your desired selection. Remote Control and Remote Desktop: Controlling the Remote/Host Computer Laplink Gold for Windows 7 offers three remote connection options which let you use your computer to perform tasks on another computer, designated as a Laplink Gold Host: Remote Control (Laplink Gold legacy option), Microsoft Remote Desktop (RDP), and Laplink Remote Desktop (NEW for Laplink Gold for Windows 7). Remote Control: Laplink Gold legacy remote option allows you to connect to Host PCs with older versions of Laplink Gold. Note: You must use Remote Control to make a remote connection to a Laplink Gold Host PC running Windows Newer operating systems should use one of the two Remote Desktop options, which will allow for a quicker connection (see next). 12 10 Microsoft Remote Desktop (RDP): RDP is a Windows service that is integrated into Laplink Gold for Windows 7. 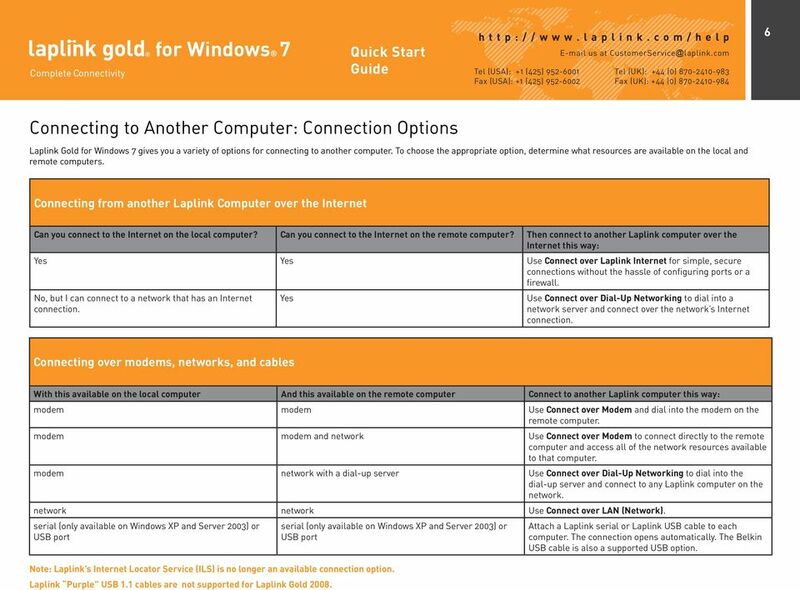 It can be used to connect from any Laplink Gold Guest system but is available ONLY when connecting to Host computers running Windows operating systems as specified in the system requirements (see page 2). Once the Laplink Gold Guest computer has made the connection to the Host, the screen on the Host PC will be locked. A local user at the Host PC will be unable to use the computer or see what is happening with the remote session. 3. Then, select whether you prefer to use Laplink Remote Desktop Host or Microsoft Remote Desktop Host. If it is not possible to use your preferred choice, Laplink Gold will automatically make the remote connection using the other option. Click Apply and then click OK to save the changes. Note: The User Name and Password for Microsoft Remote Desktop are the same as your Windows logon credentials for the Host PC. Windows must be configured on the Host computer to allow Windows Remote Desktop connections. Please refer to Windows Help and Support or the Microsoft support Web site for details on configuring Microsoft Remote Desktop. Laplink Remote Desktop is an option for those operating systems (Windows XP and above) that cannot use Microsoft Remote Desktop (see next). Laplink Remote Desktop (NEW): Laplink Remote Desktop is a new remote connection option in Laplink Gold for Windows 7. It allows you to connect to Laplink Gold Host PCs running Windows XP and above. Laplink Remote Desktop is an alternative for those Windows operating systems that cannot use Microsoft RDP. Unlike Microsoft RDP, Laplink Remote Desktop doesn t lock the screen of the Host PC, and thus allows you to share the screen with a local user at the Host computer. Note: The User Name and Password for Laplink Remote Desktop are the same as your Windows logon credentials for the Host PC. Choosing the Remote Desktop Option - Laplink Gold will automatically choose which Remote Desktop option to use based on your settings. To modify the Remote Desktop settings, go to the Options menu and choose Remote Control Options: Other Remote Connection Settings - If you choose, you can make changes from the defaults on the other Remote Control Options tabs. When finished, click Apply and then click OK to save the changes. 1. Click the Remote Desktop Host tab. 2. To have the option to use both Microsoft Remote Desktop and Laplink Remote Desktop, make sure that both Enable Laplink Remote Desktop Host and Allow Connections to Microsoft Remote Desktop Host are selected. 13 11 File Transfer You can also keep files in specific folders synchronized between computers using the SmartXchange feature. This feature can be accessed by opening a File Transfer connection, selecting the folders to be synchronized on each side, then clicking on the SyncTools menu, and then on SmartXchange. Using SmartXchange, you can synchronize two folders on a one-time basis, so that both computers will have the newest version of all files in those folders. Care must be taken when performing this function to ensure that you do not accidentally overwrite files that you do not want overwritten. Note: For information on the Xchange Agent, which allows you to set up recurring synchronizations, see the Xchange Agent Synchronization section that follows. Xchange Agent Synchronization This function allows any number of files and folders to be transferred between the two Laplink computers. In some instances, you may not want to transfer a file, such as copying an older version of a given file over a newer one. In the File Copy window, shown next, you can set options that determine when a file is copied. When you drag a file from one window to the other, you will see this dialog box: Xchange Agents automate and save the functionality of SmartXchange. To set up an Xchange Agent: 1. 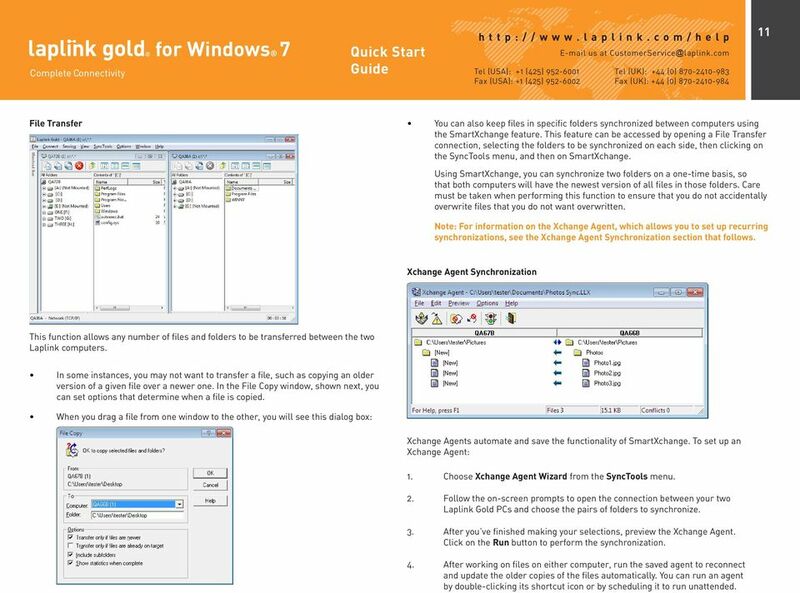 Choose Xchange Agent Wizard from the SyncTools menu. 2. Follow the on-screen prompts to open the connection between your two Laplink Gold PCs and choose the pairs of folders to synchronize. 3. After you ve finished making your selections, preview the Xchange Agent. Click on the Run button to perform the synchronization. 4. After working on files on either computer, run the saved agent to reconnect and update the older copies of the files automatically. You can run an agent by double-clicking its shortcut icon or by scheduling it to run unattended. 14 12 Print Redirection Text Chat You can control whether a file will print on a remote or local printer regardless of whether the file itself resides on the local or remote computer. This allows you to print in your current location (local) or on a printer attached to the other computer (remote). Text Chat lets you communicate with someone on another Laplink Gold PC by typing text in a window. Voice Chat Voice Chat lets you communicate with someone on another Laplink Gold PC by voice (as though on a telephone). Quick Start Guide. Laplink Software, Inc. Quick Start Guide MN-LLTLBR-EN-05 (REV. 02/2010) h t t p : / / w w w. l a p l i n k.
Image Assistant. User Guide. Image Assistant. Laplink Software, Inc. User Guide. The ONLY Way to Restore an Old Image to a New PC! Symantec pcanywhere User s Guide Symantec pcanywhere User s Guide The software described in this book is furnished under a license agreement and may be used only in accordance with the terms of the agreement. QBalance.com. We make QuickBooks work for you. Call Toll-Free: (800) 216-0763. Congratulations! You are using the best accounting software available! USB TO SERIAL CONVERTER User Manual (DA-70155-1) Index: A. Windows Driver B. MAC Driver C. Linux Driver A. Windows Driver 1. Product Features 2. System Requirements 3. Driver Installation (Win2000) 4.